Walmart has experimenting with some pretty large green roofs atop its stores, but green cleaning products company Method is taking this concept even farther. It is teaming up with Chicago-based Gotham Greens to plant what is being billed as the world’s largest urban rooftop farm. The 75,000-square-foot installation will be part of Method’s new manufacturing plant designed by William McDonough + Partners and planned for the south side of the city. 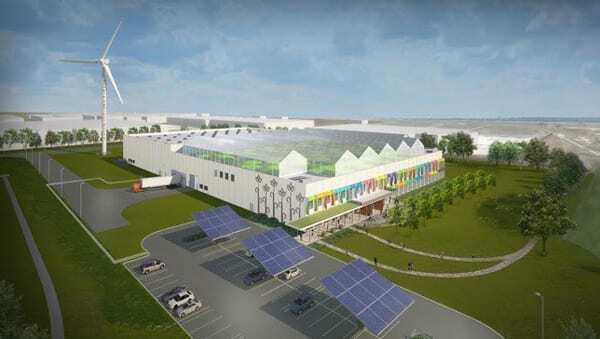 The greenhouses are being designed to grow up to 1 million pounds of fresh produce annually, which will be sold to local restaurants and grocery stores. Gotham’s hydroponic greenhouses are outfitted with LED lighting, advanced window glassing and “passive ventilation” to keep electricity costs and heating to a minimum. The power for its installations often comes from on-site solar panels (although the rendering for the Method plant pictured below also shows a wind turbine). The technology uses 20 times less land and 10 times less water than conventional agricultural methods, according to the Brooklyn, N.Y.-based company. This is the Gotham’s first project outside of New York City. It’s been growing bok choy, Swiss chard, arugula, basil and other leafy greens in a handful of rooftop farms near its home base, including the Whole Foods facility in Brooklyn. The new Chicago facility is Method’s first foray off its home turf in San Francisco—it looked at more than 100 sites before picking the Pullman neighborhood. Learn more about this project on the William McDonough + Partners website.